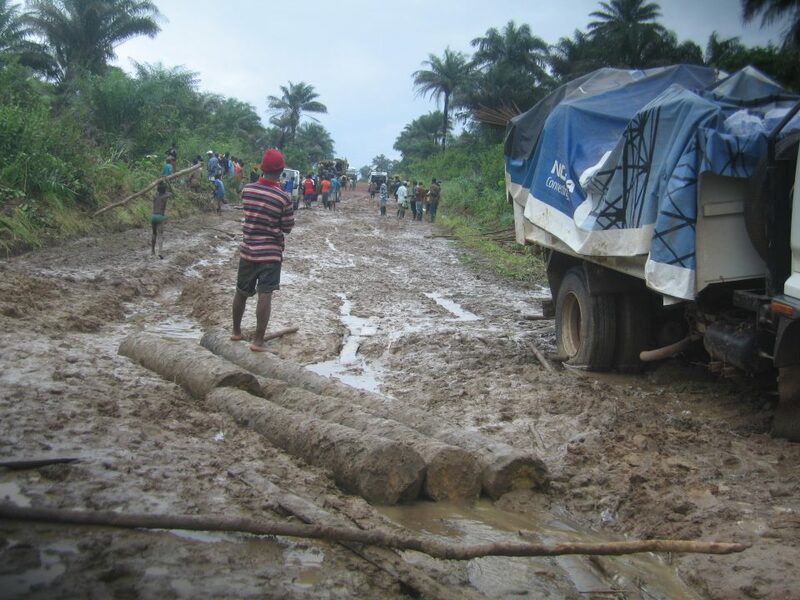 This week is typically the peak of the rainy season in Sierra Leone, and it’s really raining this year. A main bridge in Freetown collapsed yesterday under the heavy rain and a landslide. Several people are known dead, and more likely dead with homeless normally sheltering under the bridge. This bridge connects main routes in the capital, and will further snarl traffic in the already gridlocked city. The bridge is called a relic of the colonial days, and is perched on one of Freetown’s many steep hillsides that descend down to the bay. Many U. S. cities feel they are in a dilemma in not being able to repair or replace aging bridges and infrastructure. In comparison, Sierra Leoneans would feel privileged to have the bridges we have. It’s also a historic area where slaves leaving Sierra Leone for the New World were brought to the wharf as their departure point. They usually were taken to Bunce Island, a major slave fort now in ruins on a small island in the bay to await the sale sealing their fate. Another bridge collapse occurred in February on my route from Rotifunk to the capital. We had planned to take the Mabang bridge back to the capital on a Saturday morning prior to my flight home on Sunday. Late Friday afternoon Chief Caulker received word that the bridge had collapsed under a heavy truck trying to cross it. Fortunately, Principal Kaimbay had just safely crossed twenty minutes earlier in a small vehicle. People blamed the Mabang collapse on the truck. I said, the truck is bringing goods upcountry, and that means business. If you want development and bigger business in this area, you need a bigger bridge. 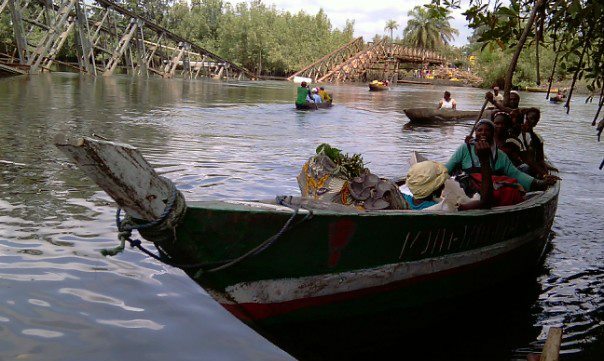 It wasn’t the truck’s problem; the bridge was inadequate for the people who needed to use it. The bridge creaked and groaned when we had crossed a few weeks earlier in a car. We literally inched our way over loose boards placed length-wise to strengthen the old bridge surface with its many gaps. It was fightening, especially knowing we were perched 20+ feet in the air and crossing in the dark. Chief Caulker paused on hearing the news of the collapse that Friday last February. He then quietly leaned towards me and said, people don’t know how hard we fought to protect the bridge from rebel control during the war. Four lives were lost, one my cousin. The bridge is at a strategic point and rebel control would have given them a clear line onto the capital. So, now the bridge long overdue for rebuilding was lost to overuse. And the people of Rotifunk must today take alternate feeder roads to get to the main highway that goes to the capital. That adds one to one and half hours onto to their already four hour long trip to Freetown – a city that’s only 55 miles away. Well, that was in the dry season. The chief told me two weeks ago it took him eight hours to reach Rotifunk. That probably includes over an hour to get through Freetown’s traffic gridlock. Or, people can risk taking a canoe across the river past the collapsed bridge, and pick up another public transportation vehicle on the other side. The cost of the trip is up significantly either way you go. You can take the longer detour in one vehicle, or pay two vehicles with the river crossing. Either way, people who can hardly afford the normal trip, are penalized with extra cost on top of extra time to now make the trip. The government promised a temporary pontoon type ferry of the type I used 35 years ago. Fifty five gallon drums are strapped on a platform big enough to hold a small truck. A cable spans the river and you are pulled across – by hand. Five+ months later, there is still no ferry. One of my Rotifunk colleagues, Alpha, passed on recent Facebook pictures of the collapsed bridge crossing. The river swollen with the heavy rains is running fast with strong currents, and crocodiles have been noted now in the rainy season. Most would say climate change is increasing the rains over and above the usual monsoon level rain. How rainy is rainy? Here in Cincinnati, we’ve had a year with a lot of rain. We hit 30 inches now for the year to date, with 27.5 inches the norm. We’ll easily hit the 42 or so inches normal for the year. Freetown is the wettest part of Sierra Leone, being the western-most peninsula of the western-most country in West Africa. It’s the first place to catch all the prevailing winds blowing in from the Atlantic Ocean – and with those winds, all the rain. The city gets 175 inches/year, with most of that falling June – September. July and August are the rainiest, each month bringing in over 40 inches. That’s more than Cincinnati gets for the whole year in one month. Road outside Rotifunk in last year’s rainy season. Rotifunk used to get “only” about 120 inches per year. These days, who knows. When you’re faced with traveling on roads like this, does it matter if it’s 120 or 130?! I remember this week in Sierra Leone very well. It’s my anniversary. Our Peace Corps group arrived in-country on August 9. It’s also the week the rain seems to reach the peak of its crescendo over the past three months, and it rains 24 hours a day almost without a break for seven days. That’s what you call rain. Let’s pray the Mabang ferry is installed soon, and this new hardship for the people removed. In the meantime, the silver lining is that all that rain is what’s making the rice grow. Pretty! This has been an incredibly wondrrful article. of amazing and really excellent stuff for readers. Hi. Thanks for your comment and your support. Sharing our info with others is a big help. Really appreciate that. Please come back to read about Sherbro Foundation’s 2014 projects. encountering problems with your RSS. I don’t understand why I am unable to subscribe to it. Thanks. Glad you enjoyed the post. Sorry, haven’t had other problems with RSS. Thanks so much. Really appreciate your comment. Marina, Thanks you for your comment! I’m glad you enjoyed the post and come back to read more. your articles? I mean, wht you say is fundamental aand everything. blog could certainly be one of thee best in its field. Hope you stop back again. Awesome blog design! What’s the name of it? It’s WordPress site using the Skylark template. Glad you like it. Evryone loves what you guys are usually up too. This kind of clever wok and reporting! Keep uup the awesome works guys I’ve included you guys to my own blogroll. Hi. Thanks for the comment and your support! Hope you visit in 2014.